Following on from last week's recipe and instructions on how to make Oat Milk, this week I'll show you how to make Almond Milk. I prefer the almonds and water approach! Here's how to do it. 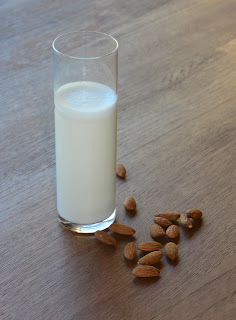 Soak 1 cup of organic almonds in water for 24 hours or overnight if you are short of time. Use enough water to cover the nuts. Make sure it's good quality water! 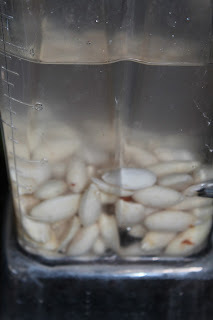 Drain and rinse the almonds after their soak. 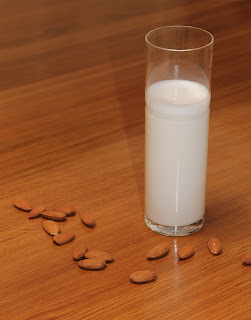 Remove the skins of the almonds. This is optional but gives you a much whiter milk and is easy to do. I timed myself and it took only 3 minutes to take the skins off! Once the almonds have soaked, just use an action like you are squeezing the almond and the skin comes off whole. Place the almonds in a blender (I used my Vitamix) and add 3 cups of water. You can actually add more (up to a total of 4 cups of water) or less, depending on how creamy or liquid you want your milk. Blend until smooth. Don't over blend or the milk will start to heat up. 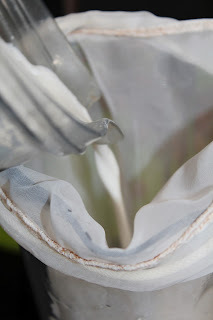 Pour into a nut bag*, suspended over a jug and squeeze the milk out using your hand. Squeeze well to get all the milk and until the pulp is crumbly. There isn't a lot of pulp that remains in the nut bag so you can either discard it or use it in your oatmeal or cereal or baked goods. Now pour yourself a glass of delicious, healthy, unsweetened, organic almond milk and enjoy, or else use it in baking, or cooking as a dairy substitute or on your cereal for breakfast! 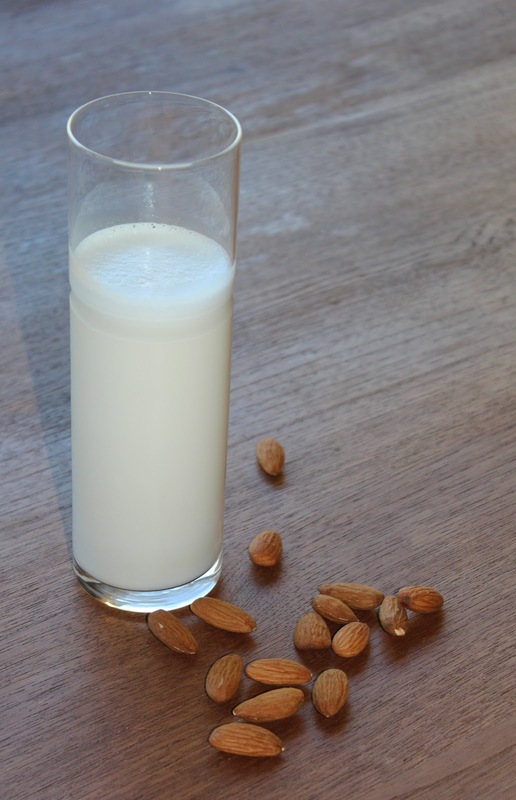 The photo below shows the lovely white color of homemade almond milk - on the right - compared to bought almond milk on the right. The milk will last at least a week, kept in the refrigerator. *Re: nut bags. Nut bags are available at cook shops and are a mesh fabric that holds small particles inside and lets the liquid run through. They are sometimes called jelly bags too - for when you leave homemade jelly to run through. Here is a source at Lakeland in the UK, or on amazon.co.uk. In the US, there are plenty of options like this one on Amazon, or check out your local cookware store. Alternatively, you can just pour the milk through a double layer of cheesecloth to remove the pulp. I'll show you another dairy free milk next week. They are much better for you than drinking dairy. And taste yummy too! What is your favorite?